It's important to have disabled portable hire facilities at any event. By catering for everyone's requirements, you guarantee a successful event or function. Our portable disabled toilets are fully equipped, easy to access by wheelchair, and have specialist facilities included. Our portable disable toilets are specifically designed with flat floor access, low level dispensers, and as larger units, our portable disabled toilets are fit for any function. They come with full width handrails, generous door width, and room for an attendant or carer. Don't let any of your guests feel left out, hire our portable disabled toilets for any event or construction requirement. 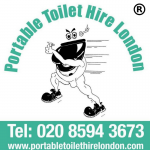 Please contact our dedicated team at Portable Toilet Hire London to discuss the requirements for your event and ensure that you are fully satisfied and have all the information to hand for you to book disabled portable toilets for your function. The portable toilets are delivered to your location in London, Essex and the surrounding areas.